S&P 500 - The SPYs have spent the past three weeks consolidating between the $270 and $275 levels. Technology - In March the XLKs broke the uptrend that began in 2015. On Friday they broke the top side of the recent consolidation range that was between the $68 and $70 levels. They are overbought now. Financials - The XLFs rebounded after becoming oversold and finding support again around the $26.80 level. The are now in the middle of the range that they have been in since late March. Healthcare - The XLVs have been trading in a range between $80 and $84 since the end of March. They are currently near the top of the range. Consumer Discretionary - The XLYs have been trending higher since April and testing short-term resistance around $107. The recent lows in February and April were around the $98 level. Industrials - The XLIs have broken the recent downtrend that began after they hit an all-time high around $80 in January. The are consolidating around the $75 level. Consumer Staples - It is important to watch the $50 level in the XLPs. It has become a short-term resistance level. This level was the low in 2016, and the top of the range throughout 2015. Energy - The XLEs failed at the $78 level. This is the same level that they found resistance at in January. They also hit resistance and rolled over at this level in December of 2016. They found support around $74, which was the top in late April. Materials - The XLBs failed at short-term resistance around the $60 level. This level was resistance in late April. They are consolidating around $59. 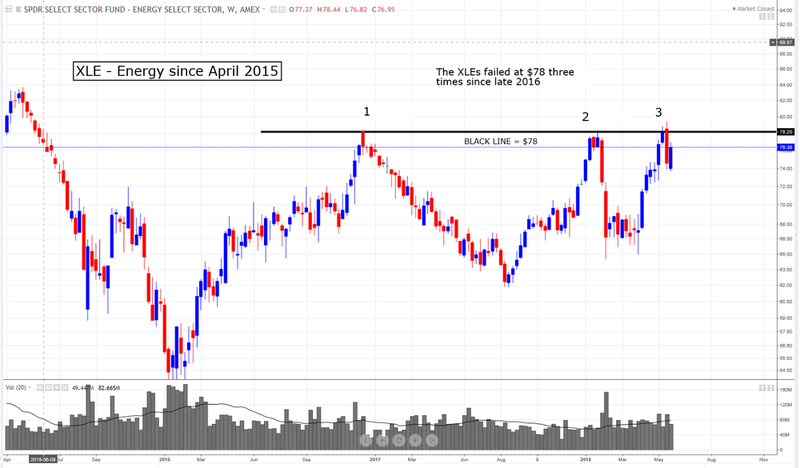 Utilities - The XLUs are testing short-term support around the $49 level. This level was also support in late March. They have broken the short-term uptrend that began after that. 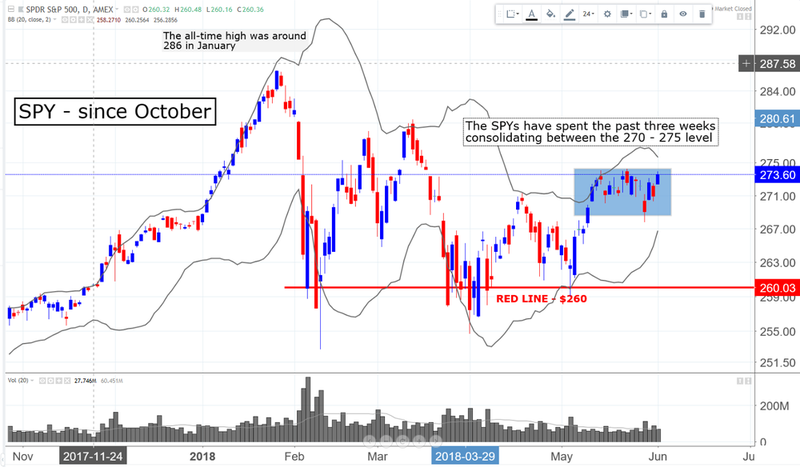 S&P 500 - The SPYs have spent the past three weeks consolidating between the $270 and $275 levels. The recent lows in early February, late March and early April, and again earlier this month were around the $260 level. The recent all-time high in late January was around the $286 level. Technology - In March the XLKs broke the uptrend that began in 2009. On Friday they broke the top side of the recent consolidation range that was between the $68 and $70 levels. They are overbought. This sector is 27% of the S&P 500 makeup. Financials – The XLFs rebounded after becoming oversold and finding support again around the $26.80 level. The are now in the middle of the range that they have been in since late March. This sector is 15% of the S&P 500 makeup. Healthcare – The XLVs have been trading in a range between $80 and $84 since the end of March. They are currently near the top of the range. This sector is 14% of the S&P 500. Consumer Discretionary – The XLYs have been trending higher since April and testing short-term resistance around $107. The recent lows in February and April were around the $98 level. This sector is 13% of the S&P 500. Industrials – The XLIs have broken the recent downtrend that began after they hit an all-time high around $80 in January. The are consolidating around the $75 level. The recent lows in November, February, and early May were around the $71 level. This sector is 10% of the S&P 500. 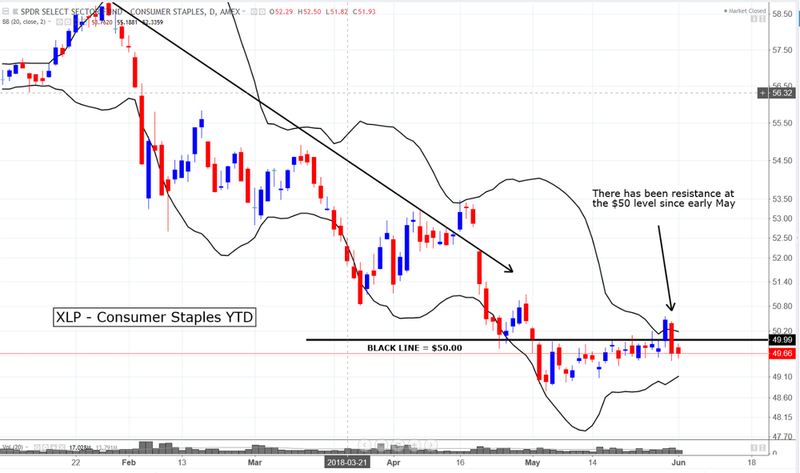 Consumer Staples - It is important to watch the $50 level in the XLPs. It has become a short-term resistance level. They failed there last week after becoming overbought This level was the low in 2016, and the top of the range throughout 2015. This sector is 7% of the S&P 500. Energy - The XLEs failed at $78 after becoming overbought. This is the same level that they found resistance at in January. They also hit resistance and rolled over at this level in December of 2016. 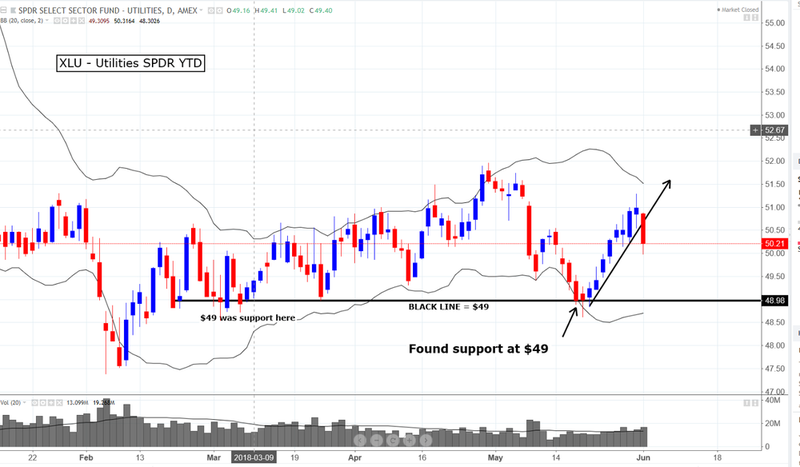 They found support around $74, which was the top in late April. This sector is 6% of the S&P 500. 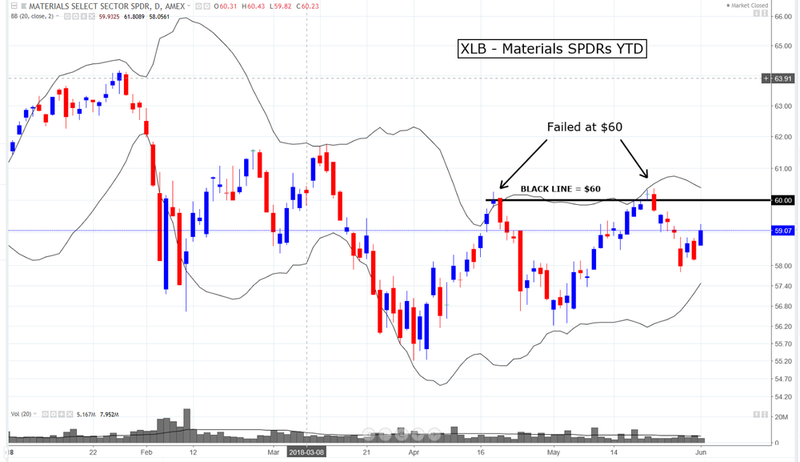 Materials - The XLBs failed at short-term resistance around the $60 level. This level was resistance in late April as well. They are consolidating around $59. This sector is 3% of the S&P 500. Utilities – The XLUs found support around the $49 level after becoming oversold in mid-May. This level was also support in late March. They have broken the short-term uptrend that began then. This sector is 3% of the S&P 500.